A hush of expectation took over the room. The Baton Rouge Metro Council was now going to vote on whether to include “sexual-orientation” and something called “gender-identity” on the list of non-discriminatory city ordinances. Months of a well-oiled and well-financed PR offensive by the LGBT (Lesbian, Gay, Bi-sexual and Transgender) lobby to pressure the city councilors of Louisiana’s Capital City to give privileged status to a chosen immoral behavior, was now at stake. It was to be one more success story for the national LGBT movement. Similar ordinances passed in Shreveport, LA in December, in Houston, TX in May, and in San Antonio, TX last September. Cameras and smartphones were held high to record the vote. Suspense hung in the air. Then the electronic board flashed: 8-4. Two thirds of Baton Rouge Metro Council voted down the proposed change. “Cowards” shouted two male voices from the back. A joyful burst of applause resonated two rows away from the city councilors: eyes turned toward the ladies whose femininity reflected their intense joy at this victory for traditional family values. Yes, this was a big victory for the family. Had the homosexual measure passed, it would have been a tool for reverse-discrimination in Baton Rouge against Christians who object to immoral “lifestyles.” This is what we already see happening with Christian businesses throughout the USA and Canada. This is the objective of a national strategy devised by a network of LGBT organizations: cower and silence the majority of Americans who oppose the homosexual agenda. In the many emails, phone calls and letters sent to the Baton Rouge Metro Council members, this protest of the Catholic Bishops to President Obama’s draconian measure was quoted. Nevertheless, it was troubling to see several liberal Catholics at the forefront of this cultural and religious war, peddling the homosexual movement’s agenda. Some media outlets are now presenting this victory for family and morality in Baton Rouge as predictable. Yet only weeks ago, those same media outlets were aggressively promoting the idea that this anti-family amendment was part of the inevitable march towards enlightened progress and modernity. The mantra was: “Poll shows that 62% of Baton Rouge demand this ‘fairness’ ordinance.” Everyone knows that Baton Rouge is not the Castro District of San Francisco. 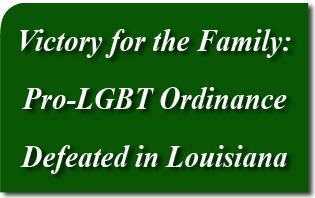 Thank God, the forces working to destroy the institution of the family, sacramental marriage, religion and morality, suffered a setback in Louisiana. But they will not stop. “We need to start putting all Christians who are against gays in gender segregated camps so that they can’t breed and all their children should be given away to be adopted by gay couples to be recast in their image. “The media needs to start doing everything in its power to portray Christians as the enemies of logic, reason and science and that they need to be dragged from their homes in the middle of the night to be taken to mass execution [sic] by guillotine.” – Comment by “sso kawai” on TFP YouTube channel. What about love, tolerance, and fairness? You know the answer. This is a spiritual battle. What has happened in Louisiana’s Capital City these past few months has awakened Catholics in the Pelican State. Catholics throughout the country, especially in Houston and San Antonio, participated in this victory for the Christian family and morality by praying, offering sacrifices, Masses, and holy hours of adoration. As we look back in history to Our Lady’s intervention in Lepanto, Catholics will one day look back to the social and spiritual battles of now — at real-time episodes where the Most Holy Virgin crushed Lucifer’s head. Lucifer who inspires all the evil in the world. Lucifer, the one Saul Alinsky dedicates his socialist Rules for Radicals book to, as the first rebel, the first revolutionary. Yes, but always defeated again and again by the Virgo Purissima. To understand the strategy and background of what is happening in Louisiana and throughout the nation, read the American TFP book Defending a Higher Law. This entry was posted in Fighting the Culture War and tagged The Baton Rouge Metro Council was now going to vote on whether to include “sexual-orientation” and something called “gender-identity” on the list of non-discriminatory city ordinances. by Thomas Drake. Bookmark the permalink.